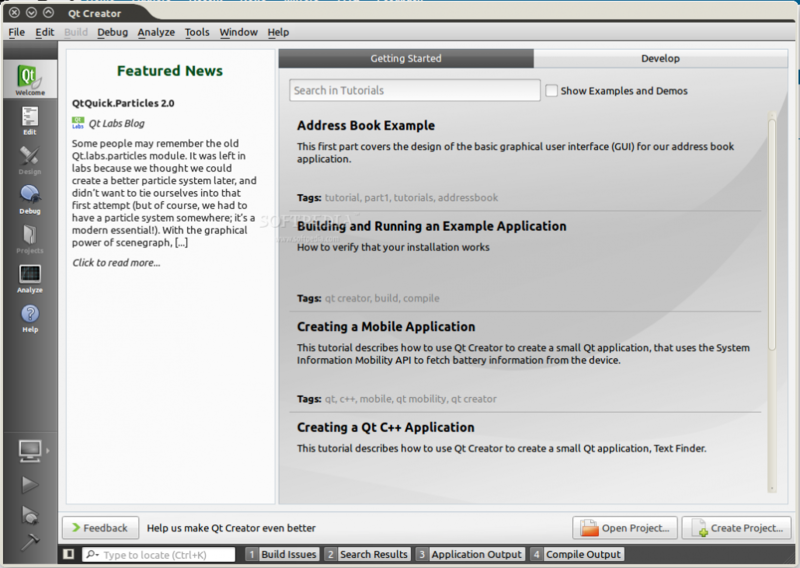 Qt Creator is a cross-platform and open source graphical Integrated Development Environment (IDE) application that provides Qt developers with everything they need to create usable and attractive graphical user interfaces (GUIs). It supports both Qt4 and Qt5 toolkits. It is comprised of a visual debugger, a forms designer and an integrated GUI (Graphical User Interface) layout. The program is engineered in such a way that it can be used by experienced and novice Qt programmers alike. It features a code editor with support for QML, C++ and ECMAscript, rapid code navigation tools, code completion, syntax highlighting, static code checking, and support for source code refactoring. In addition, it provides users with style hints as they type, context sensitive help, code folding, as well as parenthesis selection and matching modes. The integrated C++ visual debugger is capable of displaying Qt’s data in a human readable format, thanks to its awareness of Qt classes’ structures. Additionally, it can display GNU debugger’s raw information clearly. Being written in Qt, the application is platform-independent, supporting Linux, Microsoft Windows and Mac OS X operating systems. It has been successfully tested with both 64-bit and 32-bit instruction set architectures. On Linux, it is distributed as native installers for the 64- and 32-bit hardware platforms, as well as a source archive that can be configure, compiled and installed on any Linux distribution. All in all, the Qt Creator project is a very useful utility for existing and upcoming Qt developers who are looking for one of the best solutions to deploy modern and uncluttered user interfaces for their applications.